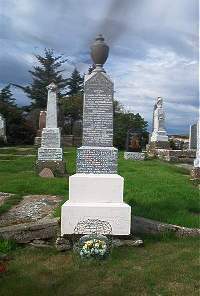 Erected by Colin Sutherland in memory of his beloved sons. Above Colin Sutherland died at Landhollow 12th May 1942 aged 84. Wife Georgina Mackenzie died at Landhallow 2nd October 1937 aged 72. Son Angus Sutherland, Lance Cpl Gordon Hrs, died at Scottish General Hospital Edinburgh 11th November 1918 aged 22. Son David died in infancy. Son Colin died in infancy. Son David died aged 1. Son Rupert John Mackay died at Western Infirmary Glasgow from injuries recieved in a motoring accident 22nd May 1928 aged 25. Daughter Christina Sutherland, Superintendant of Nurses died at London Ontario Hospital 8th April 1938 aged 39 after a short illness interred at Woodland Cemetery London Ontario. Untill the day break and the shadows flee away.